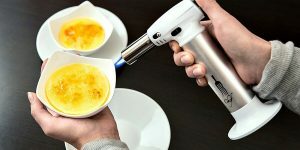 It doesn’t matter why you bought a butane torch – for work around the house, cooking your favorite dishes, learning a new hobby or just for traveling. Every user needs to know how to properly use the butane torch in order to take the most of it and avoid unpleasant situations. Actually, there is nothing difficult to turn on and use a torch, just follow the simple instruction presented below. Before we get down to business, I would like to recommend you read our recent review guide about the best butane torch, where we placed the most recent information and interesting facts, also wrote reviews of the most popular and useful stud finders, answered on the frequently asked question. also, before starting the device, make sure the torch is fully fueled and has no visible damage. Point your torch at a 45-degree angle and switch it on by turning the gas flow control valve to the right. You will hear the gas hissing, then press the ignition button (usually the largest and brightest one) to create a flame. But if your torch has a safety switch that prevents accidental flame production, turn it off at the very beginning. Following, you can change the size of the flame and choose the one that suits you by adjusting the heat output. To do this, turn the special lever in or counter-clockwise, depending on the features of your butane torch. Also, some devices have a small handle by turning which you can sustain the flame even if you release the ignition button. To disable your butane torch, slide the gas control lever to the left and wait until the flame is extinguished. Or, just turn off its button. As you can see, it’s simple as black and white to use a standard butane torch. The main rule is to always follow the instructions clearly and be very careful.